Bali Tour Photography specializes in arranging tours according to your prefference. Whether you are a professional photographer, a hobbist, or just interested in photography, let us guide you in our tours of Java, Bali, Lombok, and Flores. It is suggested that the Rinjani suite is of mantle origin, but that all the andesite and dacites as well as many of the basalts have probably been modified by fractional crystallization processes. Bromo Tengger Semeru National Park is located in East Java, Indonesia, to the east of Malang and to the southeast of Surabaya, the capital of East Java. Animal photographers often attempt to document the space as well as convey an appreciation of the scenery. To support the program Bromo Bali Tour Photography, to explore every corner in Bromo, we use the Jeep. 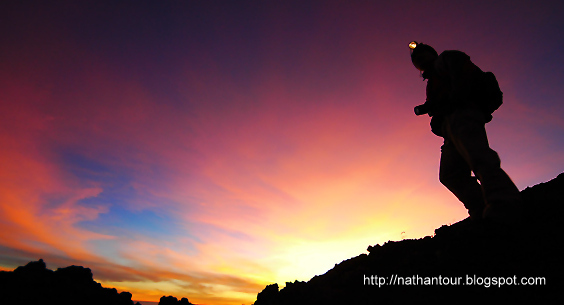 Welcome to Nathan Tour and Travel. Whether you are a professional photographer, a hobbist, or just interested in photography, let us guide you in our tours of Java, Bali, Lombok, and Flores. Let me make your holiday in Java, Bali, Lombok, Flores become unforgettable, Our service is to provide English speaking driver / guide who will be your capable mediator to the islands. If you have questions about Java, Bali, Lombok , and Flores before you fly here, do not hesitate to contact us, Nathan Tour and Travel, we will set some drivers / guides who speak English well that will take you for a holiday in Bali. Trekking to Mt. 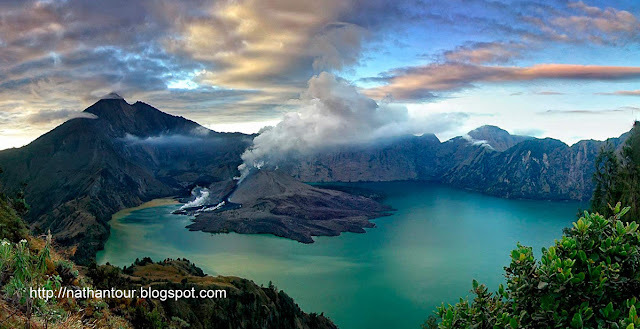 Rinjani in Lombok island start from Senggigi or Gilis Island to Senaru village and than continue the trip to Sembalun Crater. In Sembalun Crater for best camp if we would like to reach the summit of Mt. Rinjani. After sunrise from Plawangan Sembalun then drive back to Gili Island or Senggigi as your last destination. Our team will pick you up from your hotel or from arrival gate in Lombok Island. We drive on to Senaru village, where our trekking starts. We provide an accomodation in Senaru for staying one more night. We will inform you about the programs, trek routes and the procedures. If westill have enough time, probably you can spend your time to see the waterfalls. It becomes part of the exercise before the real adventure starts. At 06.00 am our team will find you in your hotel and transferring us to the Rinjani national park office to report our coming. Our adventure starts, first day we will hike about 7,2 km to crater rim it starts from 601 m asl to 2641 m asl. The track is dominated by tropical forest, and humid as well.The track is changed when you are starting hike from position03 to crater Senaru. We need about 1,5 hours to reach crater Senaru, the route becomes harder and more challenging. The route is very steep about 30 to 35 degrees, and the landscape is also drier. It looks dusty, open area and all just wild bushes. The camping area is located in crater Senaru this is our first day hike ends. We can enjoy the view while our team ispreparing your camping tend for an overnight program.The temperature can be extremely cold in the evening. When it is not too claudy you might see very clearly the lake, rinjani summit and panorama of the three gili islands. At 07.00 am we start to trek down to Senaru village and we will walk down through the same way. Normally it will need shorter time and sometimes trekker has a problem whit thier leg, the join, and their heel, it is because hard and long walking. No need to be really in rush you must make sure every things are fine. Just take a break when you feel tired, keep in well feeling, one of our team will always accompany you. When we arrive in Senaru village, our team is ready to manage your transfer to gili port or to Senggigi. Please remain your guide if you still save your things in our Senaru base camp. Price : IDR. 3.250.000/person minimum 2 people. Trekking to Mt. Rinjani in Lombok island start from Senggigi or Gilis Island to Senaru village and than continue the trip to Sembalun Crater. In Sembalun Crater for best camp if we would like to reach the summit of Mt. Rinjani. 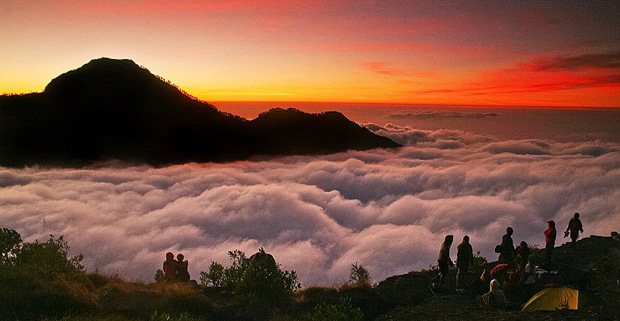 After sunrise trekking to the summit ours then drive back to Gili Island or Senggigi as your last destination. You will get a pick up service from our team, and transfer heading to Senaru village.You will stay overnight here in a hotel reserved, totally located in a very relax mountain atmosphere. Let us see, what time you get there and we have an offering to do some other activities like visiting the waterfall. First day here you will get briefing and informing you how is all the program run.